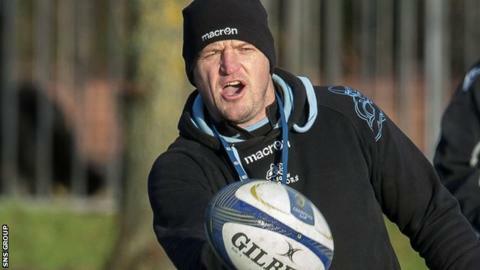 Head coach Gregor Townsend insists he will remain at Glasgow Warriors next season, dismissing a link to Harlequins as "a non-story". Townsend, who led Glasgow to the Pro12 title last season, signed a new deal in December, taking him through to the summer of 2017. "There was some speculation in the media about my future," said Townsend. "I have a contract here for next year and I'm really looking forward to next season." Townsend succeeded Sean Lineen in 2012, reaching the Pro12 semi-finals in his first campaign, while Warriors were runners-up the following term. It was third time lucky last May when the trophy was delivered in style following a 31-13 victory over Munster in the final in Belfast. Currently third in the table with three matches remaining, Glasgow travel to Scarlets on Saturday aiming to make it eight wins in a row. "We realise how important this game is, so all our attention has been on that," added Townsend. "It's in our hands now to get a semi-final place and potentially a home semi-final. "If we were to win all three [of the remaining league matches] then we'd be playing here in a home semi-final, so that's a huge motivation for the players. "We know how tough it's going to be with two tough away games against Scarlets and Connacht, teams that have been in the top four all season and Zebre in between, who will be a challenge. "We know what's at stake but I have huge belief in this group."